I'm not an extremely squeamish person. Hey, I love offal and really enjoy the sight of it in restaurants and a butcher shop. However, one thing that totally gets me is blood work. You see, I needed to get a blood test and well, it requires the extraction of blood from moi. I put on a brave face; yet it is all for show. Inside, I am a tortured soul. Actually, the wait in line is probably equally torturous! Well, this time around, it was quick. I was in and out within 10 minutes. That was great. Now I was super hungry! I had fasted for over 14 hours with hockey in between. I quickly called up Rich Gu y and wondered if he wanted to join me for breakfast. He was really in the mood for eggs benny and suddenly, The Red Wagon came to mind. The brainchild of Brad Miller, formerly of Au Petit Chavignol, Bistro Pastis and West, this unassuming little diner offers more than it appears. We were originally seated at an inside table with little natural light. I stalked the table near the window and once they began to pay, I snatched it. Anything for my pictures! So Rich Guy got his fix with the Smoked Salmon Eggs Benedict. 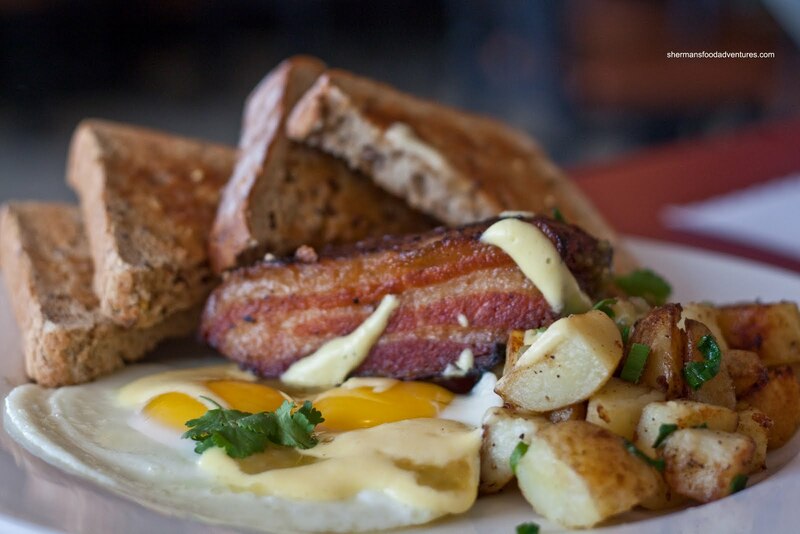 With perfectly poached eggs and a relatively light Hollandaise sauce with a good lemon zing. 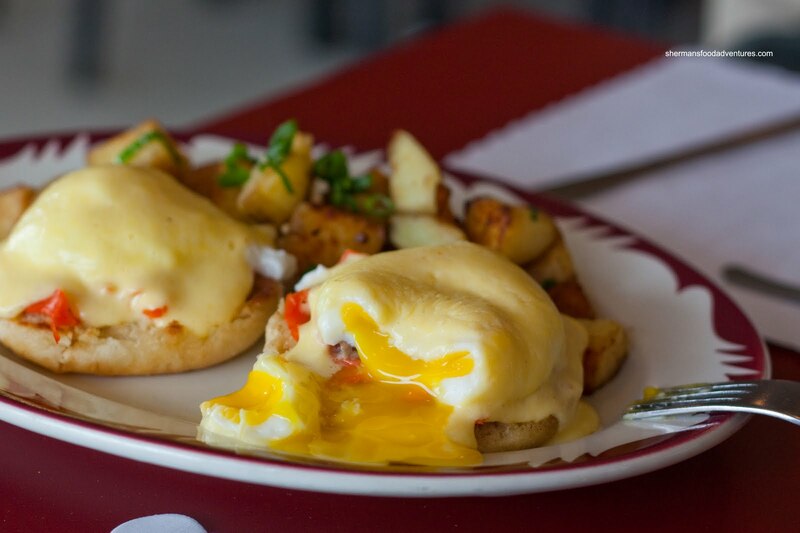 Rich Guy probably said it best: "the eggs benny is better than some fancier places". And he has been to many fancy places to quantify this statement. For me, I had 2 items that were a must-try. One of which were the Pulled Pork Pancakes. 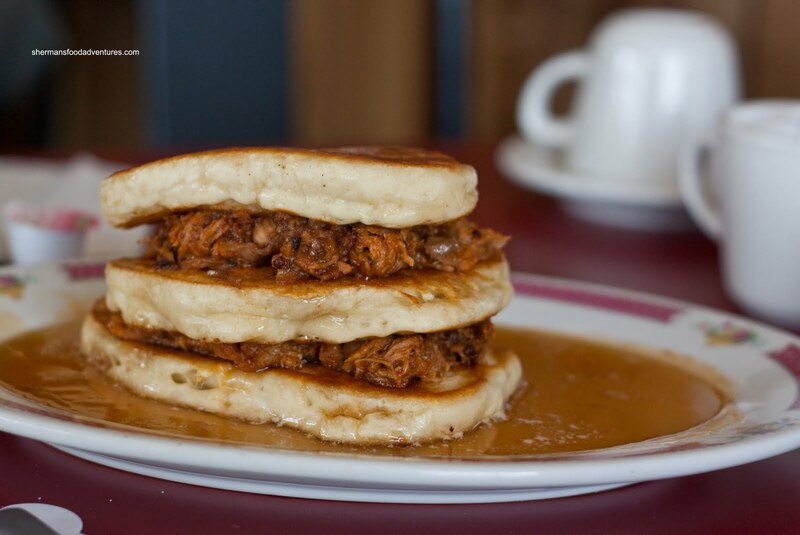 With 3 thick; yet fluffy pancakes and tender pulled pork sandwiched in between then doused with butter and syrup, these were frickin' awesome. I've had something similar at Deacon's Corner before; but this version is definitely better. It could've used a bit more sauce and less syrup (or served on the sid e); however, for what we got, it was delicious and I couldn't stop eating it. Now I mentioned that I had 2 dishes in mind... Well, instead of trying to decide, I got them both. I also ordered the Crispy Pork Belly which came with two eggs, home fries, griddled tomatoes, salsa verde, hollandaise and toast. The star of this plate was of course the pork belly. It was excellent. Completely melt-in-your-mouth meat and fat with a slightly crisp exterior, this was a sin worth committing. The only thing I would change are the potatoes, they could've been more cris py. So after loading up on a gazillion calories, we were stuffed and satisfied. I guess my starvation made me order too much... Well, that's my usual MO anyways. As for the Red Wagon, it ain't much to look at; but for the breakfast items we tried, it was very good at a reasonable price. Service was friendly and efficient for the one person working the room. Breakfast is only one portion of the menu here since they serve lunch as well. 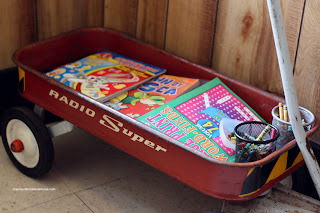 Lots of interesting items to try there as well. I will be back to try those dishes and a side of those pancakes too! I liked the pulled pork pancakes. A little savoury, a little sweet. I could only finish 2/3 of the food and had to take the rest home. It still tasted good afterwards. This gave me an idea to try it in Hawaii with macadamia nut pancakes and lau lau when I'm there. @SFF Yes, it isn't the healthiest of eats. I need to go for more jogs around the block! @Holly I think they really should put the syrup on the side, it's way too much! 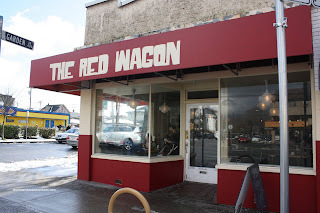 The Red Wagon has recently started staying open for supper (phone ahead to confirm the days and hours). Last night I had their special of the day - Halibut and smashed potatoes with mussel chowder sauce. The fish was cooked to perfection and the sauce was incredible. As good as you would get in any high end seafood restaurant and for only $16, I think this place is going to prove to be a popular spot for a lot more than just breakfast. @Steve Thanks! I have been wanting to go for dinner there!